With so many joint health supplements on the market, it can be difficult to find a product that truly works for you. Certain ingredients are more effective than others, and it is good to have the right combination, as well. Youtheory by Nutrawise Joint Collagen is based on just a few compounds, such as collagen – obtained from chicken – and herbal extracts. The product is advertised as being useful for cartilage repair, sustaining the joint function, reducing inflammation and pain and increasing flexibility. With so many advantages, we wanted to take a closer look at this joint health supplement. What Does Youtheory By Nutrawise Joint Collagen Contain? We notice that there are no important ingredients like glucosamine and chondroitin included in this product. This means that it may not be as potent as others. However, the presence of herbal remedies like boswellia serrata and turmeric is commendable, since these are well known and used traditionally for improving the health of your joints. The recommended dosage for Youtheory by Nutrawise Joint Collagen is two tablets taken daily with a meal. There is no official pricing listed on the manufacturer’s website, since the product is sold through third parties. So the price for one bottle can vary greatly from one seller to another. We identified no actual guarantee on the manufacturer’s website, so you may have to get in touch with the company to ask them about any issues with the product or your orders. The best joint health supplements on the market compete in terms of ingredients, price and guarantees offered. 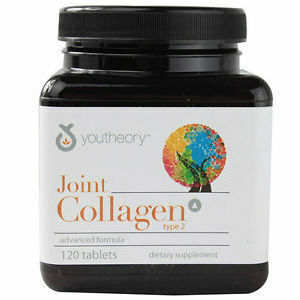 Youtheory by Nutrawise Joint Collagen has a very particular composition, made of collagen and herbal remedies. However, we did not see any of the key ingredients included, such as glucosamine, chondroitin and MSM. Hyaluronic acid is not part of this composition, either. However, as a dietary supplement, it may act as a good adjuvant for reducing joint pains. Mark Stevens	reviewed Youtheory	on April 6th	 and gave it a rating of 2.